Everybody wants to be a Ghostbuster—Melissa McCarthy, Kristen Wiig, Leslie Jones and Kate McKinnon are even going to get their chance next year— and in the ’80s, Six Flags was prepared to give park goers that chance with a Ghostbusters-themed amusement park ride, The Hauntington Hotel. /Film (via 2600 Connection) posted an interview with Roger Hector, former Atari employee, who was instrumental in designing the ride. 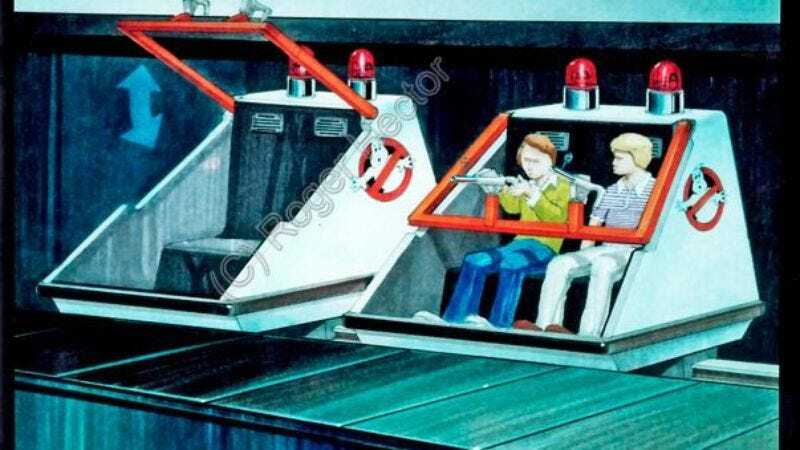 “It was another ’first; of its kind” Hector told 2600 Connection, saying “it was the first interactive theme park ride, giving its riders a ghost busting gun mounted in front of them, and a variety of sophisticated “ghost” targets to shoot at, and receive a score and prizes. The design appears to be a sort of Mr. Toad’s Wild Ride meets Doom. The rider climbs into a Ghostmobile (think of it as Ecto 1.5) after which a bar dropped down with two ghost busting guns mounted on it. The plot of the ride/game was that riders had been recruited by the Ghostbusters Agency (Venkman did note that the franchise rights alone would make the guys rich beyond their wildest dreams) and are working their first day on the job. The cart would then proceed along a stationary track for two and a half minutes through the haunted hotel that the spooks, specters, and ghosts were infesting. According to the article, “the target ghosts were a combination of physical animated props with CG displays that were combined though mirrors, and they reacted/exploded when hit. The guns were a combination of laser pointer and IR emitter that kept track of hits and displayed the player’s score.” The “ghosts” kind of resembled Tonka’s other line of toys from beyond the grave, Supernaturals. At the time Hector was designing the ride, Six Flays was owned by Bally Manufacturing, probably best known for pinball and health clubs. Bally sold its Six Flags division in 1987 before the ride could ever make it past the concept stage. Theme park enthusiasts can probably see some influence from The Hauntington Hotel on Disney’s Toy Story Midway Mania ride as well as the park’s Haunted Mansion attraction.